Kenya Moore is famously known as the most dramatic cast member of The Real Housewives of Atlanta. If we peel out that title, many people know her for her enviable resume, provocative dress sense, and attractiveness. All these have made her win big in the industry – including wearing the Miss America crown. More than that, she is a model, actress, author, reality TV star and businesswoman. Sure enough, she is still expanding her scope with multiple recent ongoing projects under her belt. What more does a woman need before she is described as highly successful? Here’s a highlight of her world including her early life, husband, mother, family, etc. The curvaceous TV star was born January 24, 1971, in Detroit, Michigan. She attended Cass Technical High School. After graduating in 1989, she joined Wayne State University, studying Psychology. She also studied communication as an extra course at the university. Moore started her modeling career at age 14 and after a few deals with top cosmetics lines, she began contesting in beauty pageants, winning Miss Michigan USA before she became the second African-American woman to win the Miss USA. Subsequently, she gradually started acting but got fully involved in 1996 with numerous film and TV credits to her name. Some of the films she appeared in include Waiting to Exhale, Deliver Us From Eva, Senseless, and others. Apart from having a long filmography, Moore has shown that she’s got multiple talents succeeding also as a film director and producing. She owns a production company named Moore Vision Media, launched in 2008. The company produced the renowned romantic thriller The Confidant. She is acclaimed as producer and director of the film Trapped: Haitian Nights. Kenya Moore has a troubled relationship with her biological mother Patricia Moore. But the reason is not far-fetched. She had her in her teens and gave her up to her paternal grandmother, Doris Grant when she was only three days old. Initially, the issue was with her two parents but her father Ronald Grant probably sees some of the mistakes he made in his teens and has now built a better relationship after being out of contact with her for years. Even so, the same can’t be said about her mother who has refused to have anything to do with her famous daughter. Ronald once told Kenya that Patricia had given her up in order to maintain her relationship with her dad. So it appears Patricia probably thinks nothing justifies her action and in a bid to shy away from making excuses for what she did, she has sworn to cut every tie that may exist between her and Kenya Moore. Nonetheless, Kenya has shown in many ways that she needs her mother. She made some meaningful moves to establish contact with her in the past but the more she tries to get close to her, the more Patricia makes it clear that she doesn’t want to have anything to the with the former Miss USA. One time, Kanye extended herself for reconciliation in a family reunion video that was broadcast on the Real Housewives of Atlanta. Sadly, things didn’t turn out as she had anticipated despite flying to Detroit to catch up with her family. Her estranged mother locked the door on her and declined to see her even with the cameras rolling. Kenya revealed that her mother has never spoken to her and made the decision at age 16 to live like she doesn’t exist. She acts like she is not visible even when they are in the same room with other family members or people. 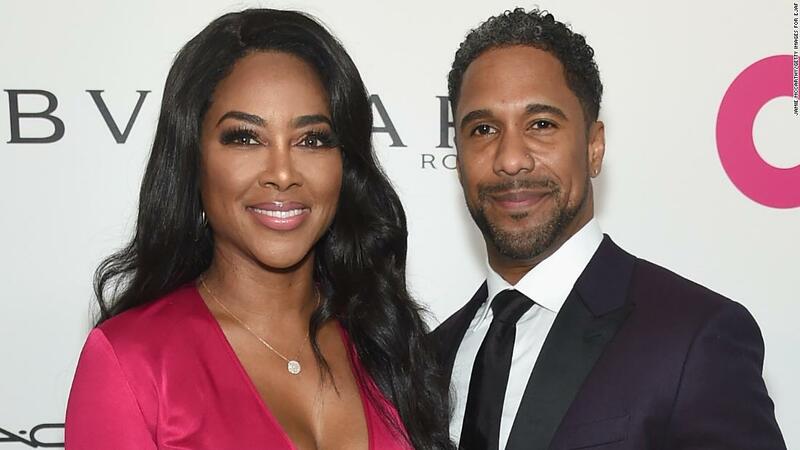 Kenya Moore secretly married the love of her life, Marc Daly in 2017. Daly is a businessman and restaurant owner. He first met the star through restaurateur and chef Roble Ali in 2016. By December the same year, they had already started something romantic. In June 2017, they wedded in a secret ceremony that took place at St. Lucia in the presence of close family. The couple is expecting their first child. Before their marriage which has been blissful thus far, Kenya dated a much younger man known as Matt Jordan. Their relationship was filled with hostility and damaging controversies. It ended in 2015 with Matt accusing Kenya of cheating with different Nigerian billionaires. The consistent publicity that came with all the drama got so unpleasant that the actress had to get a restraining order from the court against Matt. To date, she describes that past experience as toxic and doesn’t blame herself for everything that went down between them. Other men who have been linked to the beautiful actress in the past include Mike Tyson, Terrell Ownes, Allen Iverson, Walter Jackson, amongst others. As a former beauty queen, you don’t expect Kenya Moore to look anything less than stunning. She is 178cm or 5ft 10 inches tall and weighs 68 kg which proves that she is full-figured. Her body measurements including bust, waist, and hips are not available but she wears US size 12 in a dress. Her waist measures 26 inches and she wears size 7 US shoe.